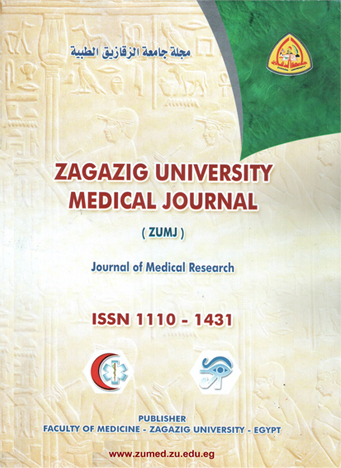 3Radiodiagnosis Department, Faculty of Medicine, Zagazig University, Zagazig, Egypt. Aim: To investigate the possible association between genes polymorphisms of the interlukin 1- β (IL-1 β) and IL-1 receptor antagonist (IL-1 ra) and susceptibility to carotid atherosclerosis in rheumatoid arthritis. Results: It was found that RA patients who had the IL 1-β allele 1 showed an increased risk to develop atherosclerosis with CIMT ≥ 0.9mm (OR = 13.2, P = 0.000) compared with RA patients with IL 1-β allele 2 (OR = 11.3, P = 0.000). While in control there was no risk to develop atherosclerosis with IL1- β alleles. Also, It was found that RA patients who had the IL1-ra allele 1 showed an increased risk to develop atherosclerosis with CIMT ≥ 0.9mm (OR = 39, P = 0.000) compared with RA patients with other alleles of IL1-ra (OR = 14.3, P = 0.000) .While in control there were no risk to develop atherosclerosis with IL1-ra alleles. Conclusion: These data suggest that allele 1 of the IL-1 β gene and allele 1 of the IL-1ra gene represent a susceptibility factor in the development of carotid atherosclerosis in RA patients.